Queen of Cups (R) shares powerful, domineering emotional energy that has lost sight of love and with it the commitment to values greater than ones own personal success. Creative forces are out of control. Recognize when someone is simply presenting a good story – they may be intelligent but inclined to exaggerate. They may mean well but may not be fully reliable. When a person lacks depth – it is unwise to relate any secrets to them. Acknowledge that it is possible for you to be deceived when you are not fully aware of the whole situation. There are people who may not have the sympathy or understanding that you think they have. Do not abandon, deny or repress your feelings – be willing now to communicate them accurately and openly. You no longer have a need to attack others or apologize for your feelings. You are now ready to reflect accurately on the outside whatever you are feeling on the inside so that the two remain in constant balance. Accept and forgive. Receive and give with love and openness and your spirit will be renewed. A creative block – the incorrect development or use of psychic abilities. In the first position: You may be asked to teach love and beauty in some difficult classrooms to some very needy students. In the second position: You may not have that person you have always counted on before to help in this situation. At another extreme, you have been less than efficient in your relationship to your environment. In the third position: This suggest that you are needed to help another or others with their emotional/creative house, to improve the flow of energy and allow more contact and pleasure. In the fourth position: A mother figure may be distorted, even rejected. Also, at an extreme, this archetype can have a idealized vision or a negative vision of motherhood flavoring the emotions in the present. In the fifth position: You may thing adversely about this queen or she about you. You may be planning to seduce someone with your winsome charm. 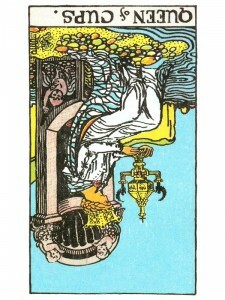 In the seventh position: If this represents someone already in your life, this may show a turn of mind between you. You may fear the power and responsibility of mothering, of caring intensely after others. In the eighth position: You may be under the serious influence, even seduction of this lady. In the ninth position: Your heart may be involved with the queen, but rather not be. Or, the opposite, this can be the symbol of your heart’s sadness over this person.